A response to my China-skeptical column? When I first learned I would be spending my summer in the capital city of Sierra Leone interning with a local newspaper called Awoko, I was excited to no end. Then, at some point during the final few weeks remaining before I fly out across the Atlantic, the panic set in a little bit – actually, more than a little bit. I felt drastically underprepared, especially psychologically. Some lazy, survival-instinct-ish part of my psyche – quite apart from any of my real wants or rational thoughts – simply didn’t want to leave the comforts of home and drag myself to somewhere that probably wouldn’t be comfortable at first. Now, I’m happy to report that the excitement has come back. I’m thrilled at the prospect of starting on this reporting adventure, and I can’t believe how lucky I am. It’s probably reasonable to feel anxious about going anywhere that requires me to jab myself with, and ingest, quite this many vaccines, take 100 malaria pills in my suitcase, and spray my outfits with a bug-killing chemical that’s “safe” but nevertheless I shouldn’t let touch my skin, or breath in. And of course, find room for lots of DEET and a mosquito net. I’m lucky that mosquitoes don’t seem to bite me all that often, and I hope it stays that way. But still. On a more serious note, I’ve been thinking a lot about the traumas Sierra Leone has gone through and how they have affected the country. These include the recent Ebola crisis, preceded by a ten-year civil war, corrupt governments, colonial exploitation and more. They seem vaster and more important than any of my anxieties about my comfort. Reading books like Lansana Gberie’s A Dirty War in West Africa, I’m simply overwhelmed trying to process what Sierra Leone went through. Despite the general flippancy of this post, this has been on my mind more than anything, and I don’t mean to make light of it. I guess I should say that’s a good general assumption to make about anything in this blog. 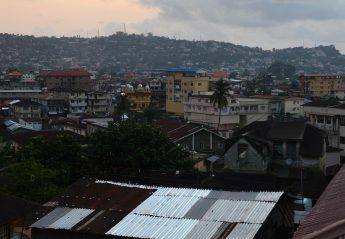 When I was accepted to the Foreign Intrigue scholarship through the UW journalism program I didn’t have final say in where I would be sent (my fellow students were sent to Jordan, India, Cambodia, Mexico and Indonesia), but in my application I said Sierra Leone was one of my top choices. I knew a bit about the country — not much, but enough to make me really curious to learn more. In middle school I saw a talk by the Sierra Leonean former child soldier Ishmael Beah, who wrote a memoir called A Long Way Gone. Actually, Beah was one of the speakers introducing the Dalai Lama, the headliner that day. But Beah’s talk stuck with me just as much as the Tibetan spiritual leader’s did, and I read his memoir sometime that same year. It’s a powerful and devastating (and apparently, sometimes questionably accurate) book. (I’ve almost finished rereading it now, and it’s a lot more difficult and painful to get through than I remembered). I watched the movie Blood Diamond years ago, and one of the only things I remember was the beginning, when rebels from the Revolutionary United Front movement brutally hack off villager’s limbs with machetes. I’d also heard a fantastic album from a group called the Sierra Leone Refugee All Stars (really, give it a listen — in the link), which is plaintive and sad at times, but mostly very upbeat and warmly positive. So, that was most of my knowledge of Sierra Leone – basically a random mix of things. In the past month, of so I’ve been ordering from online just about every book on Sierra Leone I could find, with the assumption that the more I know, the better. And really, that not doing so would be irresponsible. I also realize that no amount of reading can really prepare me. Just getting a taste of international reporting. Who wouldn’t be excited at that last one? Or going to Sierra Leone in general? great post, nice collection of books.